Listen in to hear the first exclusive podcast interview with Worksafe New Zealand’s new Chief Advisor for Health and Safety Innovation, Daniel Hummerdal. Plenty we can learn, not just from a regulatory perspective, or just in New Zealand – as always, this one is jam-packed with translatable insights. 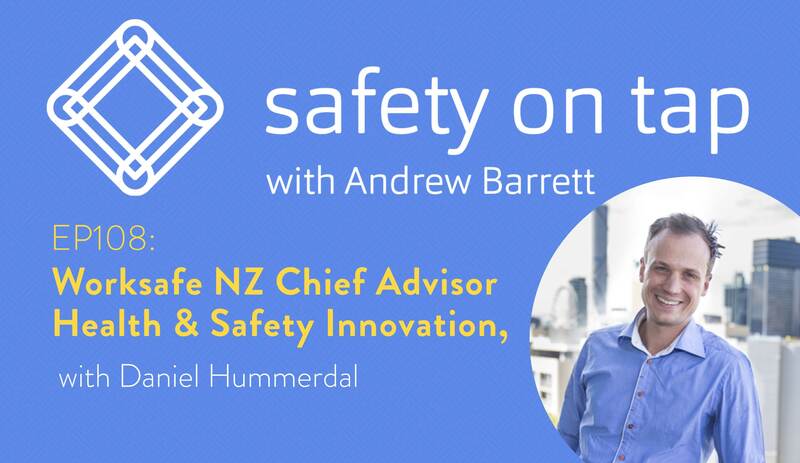 Today I’m chatting with Daniel Hummerdal, the relatively recently appointed, and first, Chief Advisor of Health and Safety Innovation at Worksafe New Zealand, the countries sole government regulator for work health and safety. My curiosity was really the driver for this conversation – the organization, the role, that it’s new, that it’s about innovation, and Daniel’s reputation for challenging the status quo to search for more effective ways to improve health and safety – I just wanted to know more. So I thought I’d share that exploration with you! First, there seems to be a groundswell of realization, ever more public and brave, that health and safety is overcome by bureaucracy and stuff we do in the name of health and safety that just doesn’t have an impact. I discuss that in episode 92 if you want to hear my thoughts on some cutting edge research on this topic which is making the critical jump from knowing there is a problem, to have a workable solution. Decluttering, as it has been coined by previous guests Drew Rae and David Provan, is not simply a matter of throwing things out. It’s important to understand what is clutter (vs what is not), how clutter is created, and then start to work on a robust and defensible approach to making changes to reduce safety clutter. Dave Provan and I are delighted to have created a safety clutter scorecard, which is designed to help you understand more about safety clutter, how you and your organization fare right now, and what you can do about it. The best bit is that we are making this available to the world, for free. The reason is that safety clutter is just too big a problem to not work on but to arbitrarily slash and burn health and safety things. We want you to know about this, to be comfortable to talk about it in your organization and to take action on it. Interestingly, you’ll hear from Daniel that even Worksafe NZ recognize that many bureaucratic things, like paperwork, are not what keep people safe. But that’s just one opportunity for innovation which Daniel is leading. Daniel has a mountain to climb, but it’s sounding pretty positive, especially with senior leaders who accept and embrace the need to innovate. Let’s hope they make meaningful progress for us all to learn from. Takeaway #1: Stay true to the problem. This statement is just so juicy, I won’t be able to do it justice. But you heard how Daniel used it, in the context of the regulatory options available to Worksafe – enforcement is only one option, so do what’s appropriate for the context. Are we ever guilty of using one-size-fits-all? Not appreciating and adapting to the nuances of the people we seek to serve? I think we can all improve how we stay true to the problem. Takeaway #3: Innovation is not simply creativity – innovation must demonstrate results!. Are things better from, or after, the innovation, or not? Don’t worry about failing, that will happen – if you focus on demonstrating that something new is worth sustaining, you might yourself be leading health and safety innovation in your organization. Your transcript starts ‘Today I’m chatting with Daniel humble’ – shat a fortunate auto-spell, he certainly is! Great to see NZ regulator leading the way in experimenting and helping people find solutions. Eeek! What a funny fortuitous editing error!